The Class of '66 reports to Baker as freshmen. The Class of '66 sponsors the Baker High School 1965 Calendar. The Class of '66 start their senior year in September. Four hundred twenty-one members of the Class of '66 graduate in ceremonies held at the Columbus Municipal Auditorium at 8:00 PM on June 6. 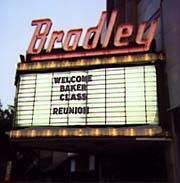 The BHS '66 reunion of 1996 is held on Saturday, August 17, at the Bradley Theater in Columbus, which has been remodeled. The pink neon marquee looks just the same under the deep blue sky of a summer evening in Columbus. Those present hear Susan Lownds Bryant '66 ask,Do you remember? Yes, Susan, we do remember, even after thirty years, because we loved our time at Baker.